A.R. Braunmuller has been at UCLA for more than three and a half decades. I saw him for the first time when I was an English major in the late seventies. I was supposed to get to his class a year earlier. 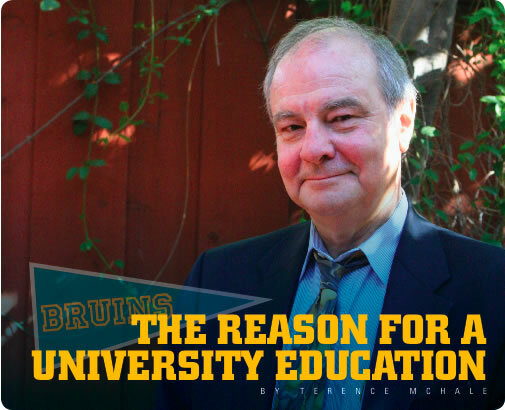 A university education was easily affordable then, and it wasn’t unusual for students to be running on a more casual schedule. UCLA has many great professors. Braunmuller is astonishing. Now, looking back, I remember Braunmuller as a great actor who chose to be a teacher. He was incredibly brash, a decade or so older than us, his dark, longish hair a concession to the time and place although he did not seem to care much about fads. He wore pinstripe shirts with a tight tie. His accent was not easily identifiable. It was not Californian. I went back to UCLA thirty years after having A.R. Braunmuller as a professor. If he had to prove himself once, he doesn’t any longer. His reputation is worldwide now as an editor and lecturer. He probably has his awards as a writer and teacher stored somewhere and, if he does, they take up a great deal of space. I sat in his classroom and asked the young woman next to me if she liked being there. Thirty years changes a man. The long dark hair is gone. I knew him when he was still young. He is now at the end of his middle years. He remains appealing. He speaks a little softer, a courtesy that ultimately comes across as an affectation because the cynicism is still intact, and his biting benevolence makes for an entertaining and somewhat risky hour and a half. Everyone is in on it. Professor Braunmuller knows more than even his best students will ever learn, yet he wants them to know everything they’ll need to enjoy the depth of the literature that he keeps fresh and still moves him deeply. He gives assignments that he expects to be completed. It is a lonely spot to have a seat in Braunmuller’s class and not have read the pages he is going to discuss. 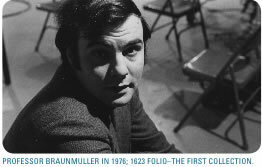 Professor Braunmuller was born in the States. His first name is Albert. He grew up in Europe. His father built businesses in the Common Market. Professor Braunmuller also speaks German and Dutch. He comes from a smart family. His mother trained as a chemist and was admitted to Columbia Medical School. His sister, slightly younger, is an economist, also a PhD. and was the third woman to gain tenure at the US Naval Academy. His happiest years as a student were during grad school at Yale, and like he did when I first met him, he still dresses button-down. We spoke in his office. It is comfortable. There are bookshelves set up library style. He made tea. California Conversations: Would you agree everyone should read Shakespeare? CC:	Should we be disappointed there are universities where you can major in English and not take a class in Shakespeare? ARB:	That is true and deeply regrettable. But, your original question was should everybody read Shakespeare? If I had to choose between more people reading Shakespeare and more people seeing Shakespeare, I’d vote for the seeing every time. Shakespeare wrote to be performed. He didn’t write to be read. Literacy has nothing to do with the original popularity of Shakespeare. He was not read to fame; he was watched to fame. He was immensely popular in his own time, and then not so popular. There’s about a hundred years from the middle of the 17th century to the middle of the 18th century where he is not the most performed, most talked about English writer. He comes to fame, to the kind of fame we have now, through the efforts of an 18th century actor named David Garrick, who made his fame as an actor and then led a renaissance of Shakespeare. He starts the fetishization of Stratford upon Avon. He commemorates Shakespeare’s 200th birthday in 1764 with a festival. That’s the start of the tourism Shakespeare. We never looked back. CC:	In the 17th and 18th century, who superseded Shakespeare? ARB:	Ben Jonson and John Fletcher, who are younger contemporaries. CC:	Are they among those who inspired the Oxfords to insist Shakespeare did not write the plays ascribed to him? ARB:	No...no. There is no question that there was somebody called William Shakespeare, and he lived and died when it is generally agreed he lived and died. Despite what people say, he is about as well documented as most of the writers of his time. It seems highly implausible that if Shakespeare’s authorship of at least most of the plays that we think he wrote was in doubt that some contemporary wouldn’t have mentioned it. None do. There is no haggling in his lifetime over his success. You can trace it. In the 1590s he was published without his name attached. The next edition of the same play is by W.S. A few years pass, and it is W. Shakespeare. Finally, he goes above the title. It is “William Shakespeare’s Tragedy of Hamlet.” The obvious inference, because this happens to several different titles, is that Shakespeare becomes a marketable commodity. It starts out with, “Hey, you ought to read this play,” and it ends up with, “This is the latest from Shakespeare.” Remember, writing plays was a highly competitive profession. The writers were trying to promote their own importance and demote their competitors. There are the negative remarks about Shakespeare but, coincidentally, with the negative remarks there starts to be highly complementary remarks-sweet swan of Avon and all of that stuff. Prior to 1623, Jonson has been extremely critical of Shakespeare. He makes fun of “A Winter’s Tale.” He makes fun of “The Tempest.” He makes fun of other playwrights, too, but he was an extremely envious man, or at least he didn’t conceal his envy as well as some. He felt an intense competition with Shakespeare and then he finally admits Shakespeare is the best writer of them all. CC:	1605, 1607, at some point, the sonnets are published. CC:	1609. Why would he write three or four long poems, 154 sonnets, and then never write again in this particular style? ARB:	Ah, I think I can answer that. The long poems, which are first published in 1593, are motivated by a couple of things. One is that the theaters are closed because of the plague and Shakespeare has no income. The way you get an income if you’re trying to get started in the theater, or have poetic talent, is to write something and then get a patron to give you money for it-money in return for the dedication of the poem. This he does. These are very successful poems. He dedicates them to the Earl of Southampton, who is a young man about town, very wealthy, very beautiful, extremely well connected, and just living a life of dissipation, really, and who figures he needs the prestige of having patronized these poems. The most curious question about Mr. William Shakespeare’s sonnets is not their publication in 1609, and he didn’t write any more sonnets, it’s why it took so long to get into print. The sonnet vogue is a decade earlier, and as far as we can tell, aside from some revisions in the very earliest 1600s, he’s finished with sonnets before the end of the 1590s. They just piled up somewhere. Why anybody thought it would be a commercial success to publish them in 1609 is a complete mystery. CC:	Were they published without his permission? ARB:	It looks that way. Opinions differ...the next time they were published is 1640. They did not sell like hotcakes. The best guess is that now they’re playing on Shakespeare’s name, and thinking everything with the brand will sell. CC:	Let’s talk about the sonnets for a few minutes. I mean, obviously, the 18th sonnet-"Shall I compare thee to a summer’s day"-is the most famous of all. CC:	(laughs) Uh-oh, I know how this is getting handled. ARB:	And I said, “Shakespeare’s most famous sonnet? What is Shakespeare’s most famous sonnet?” The class, as a whole, replied, “Shall I compare thee to a summer’s day.” Now, how did you come to that conviction? Who decides most memorable or most famous? ARB:	You may be right. CC:	Just to break that down for a second. Who is the fair youth? ARB:	If it is anybody historical, it’s probably Southampton. CC:	So often it gets interpreted as evidence of Shakespeare’s bisexuality. ARB:	Oh, of course, yeah. Although, the general argument in the poems is that you should get married and have a child, because if you don’t your beauty will die and live only in my poetry. That there was a sexual relationship was entirely possible. There are a lot of his sonnets, not just the first 18 or 19 or 21 or however many your particular argument favors that can be interpreted as male addressee and a male speaker. That has never seemed very interesting to me. CC:	Who is the dark lady in the sonnets? ARB:	Nobody knows. The problem with trying to use the sonnets as biographical evidence is that they are inevitably fictive situations. Shakespeare is in the business of inventing. That’s what a dramatist does. It’s also what a sonnet writer does. The miracle of the sonnet is that in so few lines you can get this whole situation put before you. Oh, she’s betrayed him and he’s betrayed her and they’re lying to each other about it and he knows and she knows but who knows, and so on. He could have invented the dark lady. In fact, he has to invent the dark lady for us to achieve this. CC:	Shakespeare’s family...at 18 he marries Anne Hathaway. ARB:	Germaine Greer has just written a book called “Shakespeare’s Wife” in which she does a very good job of imagining Anne Shakespeare’s life in Stratford. She is running a very big operation. She is running a household with three kids. She’s running servants. She’s running a self-contained enterprise of some complexity, and as he acquires land, she presumably becomes his legal representative in disputes and so forth. He has to come back a couple of times for lawsuits. CC:	So, him leaving her the second best bed in his will, what’s that all about? ARB:	Well, by the fact that you mention it, you know it has been used as an example of the marriage not being loving, because everybody fastens on the adjective “second-best.” What makes a second-best bed? What makes for quality in beds? It’s the furnishing. It’s the richness of the curtains on the four-poster bed, the canopy, and the carvings. That bed, if you are of a certain wealth, the best bed goes in the guest bedroom because you want to put on a show for your visitors. The second-best bed is in the master bedroom. That’s where you and your wife sleep. Now, this can be demonstrated to be true of some households. It’s only a presumption that it could have been referred to in the Shakespeare household. CC:	How detailed is the will? ARB:	It’s pretty detailed. What it doesn’t say, and what people who write about it should say, is there are a lot of conventions about bequests and wills and testaments that are so conventional they don’t have to be written down. The expectation was that unless there was quite specific language against it, the widow gets what is called the widow’s third. CC:	His times...what impact does the plague have on Shakespeare? ARB:	Ah. Well, first off a whole industry is shut down. The theaters are closed. You lose audience, and the people may not come back. You lose talent. The actors have to disperse. They have to earn a living somehow. Maybe they dig ditches. They have to do something to put bread on the table. There were two spectacularly bad outbreaks, but the plague is pandemic and all through Shakespeare’s life there is hardly twelve months without an outbreak of the plague sufficient to close the theaters, and this was especially true in the 1590s. Then in 1603 there is an outbreak in London, and it is estimated that between a quarter and a third of the population died. The theaters are shut down by the municipal authorities on the grounds that congregating spreads the plague. ARB:	You have the Reformation, which is cataclysmic in terms of everything from individual conscience to the way church is run, to the dissolution of the monastery. CC:	How does this impact Shakespeare’s writing? ARB:	It’s hard to say. Old Hamlet seems to be talking about limbo, which is not an Anglican doctrine. ARB:	(laughs) It is a device he expects his audience to understand. “Measure for Measure” is set in Roman Catholic Vienna. It has a nun, a novice as a central character, and it has a man who pretends to be a friar and who hears confession. Was this just local color, or Vienna is in a Roman Catholic state and therefore I’m going to have these Roman Catholics? Who knows? CC:	Those who don’t believe in Shakespeare’s authorship question whether or not he had the education to understand all the environments about which he writes. ARB:	Yeah. You have to grant that whoever wrote the plays was of real historical quality as a writer. So, where do you draw the line? Did he know enough to understand how a contemporary European court operated? Cleopatra? How could he create the great female roles? CC:	How about the theory that he owns an eighth interest in the Globe Theater and he writes the first iteration of the plays he’s producing, but the plays that ultimately get published evolve with different individuals involved in the writing? ARB:	Anybody who has experience with the modern theater, and there have been some excellent case studies of this, knows that unless Samuel Beckett is involved, most plays from first rehearsal to first performance or last performance, change. There is an infinity of agents after the play leaves the playwright’s hands who can affect the text and thereby what is said in performance. It’s not usually quite as bad as a Hollywood movie or a TV show, but it’s almost as bad-bad in the sense of modification, adaptation, addition, subtraction, and so forth. We have dedications or introductions, prefaces that say this is almost a third more than what you heard at the Globe. Now, part of that is advertising. Somebody says why should I buy it, I saw it. Well, you should buy it because there’s more of what you liked. ARB:	Director’s cut, right. It’s been going on for a long time. CC:	You’ve written about Thomas Middleton contributing to “Macbeth”...is “Macbeth” your favorite Shakespearian play? ARB:	It’s one of them, certainly. CC:	You’ve certainly spent a lot of time writing about it. CC:	“Macbeth” is the shortest of the plays? ARB:	Technically, third shortest-the shortest tragedy. The tragedies tend to be longer than the comedies, so it’s even shorter than short since it’s a tragedy. There are a couple of possibilities. One is that we have a defective text-that whatever the guys got in 1623 had a page missing, or a scene missing, and whatever was missing has stayed missing. There could have been mechanical losses. CC:	How much have you identified as Thomas Middleton as opposed to Shakespeare and how do you delineate? ARB:	Well, there are two songs that the witches sing in “Macbeth” and in the 1623 folio all we get is the first line of the song followed by “etcetera.” In Middleton’s “The Witch” these two songs are given in full. So, the songs migrated into Shakespeare’s text somehow. CC:	Is that the only contribution by Middleton? ARB:	No, there are a couple of speeches for the fourth witch added, again, if you could add to something that doesn’t exist...there are about 45 lines for this speaker in all. CC:	Is “Macbeth” the first of the plays where you make the transition from Elizabethan England to Jacobean England? ARB:	Just about. “Measure for Measure” and “Macbeth” are there at the transition between Elizabeth’s reign and James’. CC:	Is Shakespeare writing “Macbeth” to curry favor with James? ARB:	It seems awfully coincidental that you get a new Scottish king and suddenly you have a Scottish tragedy. There has to be a connection. We also know, of course, that James had written on witchcraft and fancied himself a demonologist. He also presided at the trials of a bunch of witches in 1591. So, you have Scottish material; you have witchcraft; and you have allusions to anti-Catholic persecution. CC:	Shakespeare is popular with Elizabeth. He’s then concerned, I would guess, if his fortunes will change with James. ARB:	James comes to town as a devotee of the theater, and Shakespeare’s company is instantly renamed the King’s Men and made retainers of James. They each get, I think, seven yards of crimson cloth to make uniforms to walk in his coronation procession. You can infer something from this or not, but we know that very, very regularly-more regularly than anybody else-the King’s Men performed over the Christmas season, which is the big court festival season and happens to be the season of the year when you can’t perform outdoors. CC:	Back to authorship-is John Fletcher the only other person recognized as a collaborator? ARB:	Oh, at the beginning of his career there is a growing body of thought that says he collaborated on a play or that he and George Peele, the younger Peele, although he died young, too, are responsible for “Titus Andronicus.” Fletcher succeeds Shakespeare as the house dramatist...basically a contract for two plays a year, sometimes more. It is a very prestigious position, and what is happening is that Shakespeare is training his successor. CC:	Does it diminish Shakespeare to say he has a collaborator? ARB:	We wouldn’t be talking about this if there weren’t ways of discriminating between Shakespeare and not Shakespeare. Now, we’re not infallible, because we’re human, but just as I can tell you where Fletcher starts and stops, that means I can tell when Shakespeare stops and starts. It’s as simple as that. CC:	Can all of Shakespeare’s works be traced to another source? CC:	Which is his most fun play (laughs)...and I’m careful now to offer such an opinion. ARB:	Well, (smiles) another explanation for why the text of “Macbeth” is so short is that the spectacle of the witches takes up stage time. Same thing, “The Tempest” is a very short play, and partly it’s short because it has so many spectacular effects, and you have to get them all in. CC:	They’re both such crowd pleasers. CC:	Women are not a part of the theater throughout Shakespeare’s career. ARB:	Remarkably, there weren’t actresses on the English stage until the late 1660s. It remains a puzzle to us...who knows. They certainly must have had different conventions for sexual encounters. They never show one, but hugging and kissing must have been happening. It is a vexing question. Some of the young men, and let’s remember that because puberty comes later in the Elizabethan period, the young men playing women could be advanced teenagers. We could be talking about an 18-year-old here. They must have been remarkable actors, because there are plenty of, not just Shakespeare but his contemporaries, situations in which you get a boy playing a girl playing a boy. CC:	It must have been confusing. ARB:	Or it was a tremendous acting job. CC:	There’s no evidence that Shakespeare had a failed play? CC:	Is there any bad Shakespeare? ARB:	There are more successful and less successful plays by Shakespeare. CC:	If every writer has their classic, is “Hamlet” Shakespeare’s classic? ARB:	I have a colleague who wrote a book on the history of Shakespeare’s best play, and he says that for centuries it was “Hamlet.” It was generally agreed that this was the masterwork of a master dramatist. However, somewhere just after Hiroshima and Nagasaki, just after the Holocaust, just after the fracturing of 20th century world civility, “King Lear” is regarded as the masterpiece of a master dramatist. There is the nihilism of a society that not only has ended but there is no replacement in sight. CC:	At what point does the scholar become too pedantic? For example, in an afterward of T.S. Eliot poems the writer says Eliot uses trochaic pentameter only once in his writing and he uses it on the 328th line. And, it just so happens that Shakespeare in “Lear” uses trochaic pentameter in the 328th line. At what point do you say we’re parsing things so carefully we’re losing the big picture? ARB:	(laughs) We have several duties. One is to try to create the audience of the future. We are trying to perpetuate the works that we’re the guardians of, and we want other people to like them, read them, perform them, sing them, whatever form you study. In order to make them accessible I go through texts with archaic language. I deal with social structures that have completely vanished. Remember, they didn’t have bank accounts. They didn’t have insurance. So, our first duty is to usher into the present time a world that is gone. In order to do that you can’t just sit back and say, “See, kids, isn’t it wonderful”, because you haven’t told them how to measure wonderful. You have to approach your studies with a set of theoretical tools and some convictions. I shudder also when I see scholars become too pedantic. CC:	Shakespeare is only 52 when he dies. ARB:	That is a digression, but it is a good one. CC:	Christopher Marlowe...what impact does Marlowe have on Shakespeare? ARB:	You want a flagrantly over-the-top answer? 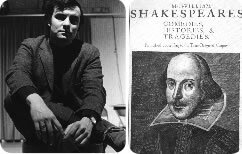 ARB:	Marlowe was an intensely successful playwright from the very beginning of Shakespeare’s career. Marlowe is a simply unimaginable turning point in spoken language, in dramatic language. I think that without the example of Marlowe, Shakespeare cannot be the playwright he is. CC:	Do you still enjoy teaching? ARB:	I do. I love it. I sometimes tease the students that the Regents send them to UCLA just for my amusement.